Erza Scarlet (19) is a S-class mage of the Fairy Tail Guild, the strongest still active female, and one of the main female protagonists in Team Natsu. 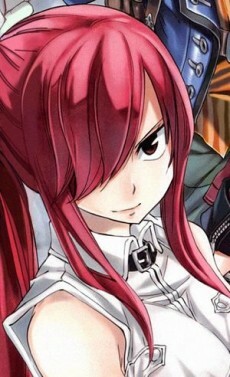 Erza, is a tall, beautiful girl with long red hair, and brown eyes. She is almost always wearing an armored suit, made by Heart Kreuz. However, thanks to her requip magic, she can wear many magic armors, and can even requip swim suits, and clothes for recreational purposes. Her member stamp is on her left shoulder. Erza is a very strict person, often criticizing the bad behavior and habits of the other guild members, causing most them to apologize for fear that they might invoke her wrath. She is also impatient, liking people who answer her questions quickly as seen when she promptly knocks out anyone who doesn't answer her questions (despite them not knowing anything). Also, Erza has a problem where she apparently sees everyone as guild members (best seen when she asks civilians to take things places during a mission). However, she has a great sense of justice. Despite being a very strict person, she seems to have a clumsy side to her as seen during the Galuna arc when she fell into a pit hole. Like most Fairy Tail members, she shows great loyalty and dedication to Makarov and the guild. She pushed herself past her limit in the war against the Phantom Lord Guild, fighting against its many powerful members. She also became the temporary leader when Makarov had to be treated because of his scattered magic. Although it hasn't been fully explored, it is implied that Natsu Dragneel, Erza and Gray Fullbuster are all very close to each other. While staying over at Lucy's house, Erza revealed that the three of them used to take showers together. It is later revealed that Erza, Natsu, and Gray have all been part of Fairy Tail ever since they were children. Erza used to be a child slave where she was forced to help build a tower called the R-system. Over time Erza made friends with other slaves, among them was Gérard. When she and the other slaves tried to rebel, the evil magicians overwhelmed the slaves, but it was then when Erza's magic awakens and kills them all, setting them free from slavery.A cult tried to build this tower to resurrect Zeref. They had slaves to build it, Erza being one of them. Erza has another flashback. In the flashback Gerard tells her they have to fight to survive now. Caught by another guard Gerard get beat and she gets sent back to her prison. No longer able to take the abuse she attacks guards, starting the revolt. At first prevailing, mages start to show up and they begin to lose. A magic blast comes towards Erza, but Rob interferes, saving Erza, but killing him. She gets very angry triggering her magic. She controls all the swords around her and wins the battle for everyone. When everyone is on the boat to go home, Erza goes back in the dungeons to look for Gerard. Already possessed by Zeref, Gerard attacks Erza and tells her he is going to complete the R-System to resurrect Zeref's body. He tells her not to tell anybody about the tower or he will kill everyone. She then wakes up on an island crying about the events just witnessed. After Erza escapes from the island of slaves, she tries to find Fairy Tail. She had heard about Fairy Tail from an old man named Rob, another slave that was forced to work on the R-system, he also cared for her like a grandpa. Eight years prior to the beginning of the story, she found Fairy Tail and taken in as a member. Upon joining, Erza immediately developed a habit to wear armour, as it made her feel safe. It was around that time when Makarov took her to Porlyusica to get a artificial eye to replace her right eye that had became blind because of an injury.